Casper Holstein was a prominent New York philanthropist and mobster involved in the Harlem "numbers rackets" during Prohibition. He, along with several other rivals, most notably Stephanie St. Clair, were responsible for resurrecting illegal gambling in Harlem after several years of inactivity following the conviction of Peter H. Matthews in 1915. The product of a biracial union, Holstein was born in St. Croix, Danish West Indies. In 1894, he moved with his mother to New York. Holstein spent most of his teenage years attending high school in Brooklyn. After graduating from high school, he enlisted in the United States Navy shortly before the Spanish American War. After the war, he held several odd jobs among being positions as a porter and a doorman in Manhattan. Eventually he worked his way up to become head messenger for a Wall Street brokerage firm. While working on Wall Street Holstein became familiar with the stock market. He also began studying the numbers system, an illegal lottery often played by impoverished New York City residents. Holstein eventually developed his own lottery called Bolito and by 1920, he became known in the New York underworld as the "Bolito King." By the mid-1920s Holstein reputedly earned more than $2 million from his lotteries. With this wealth he lived lavishly, owning two Harlem apartment buildings, a Long Island home, a fleet of expensive cars and several thousand acres of Virginia farmland. 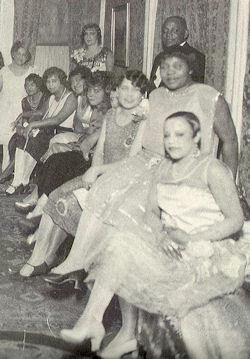 Holstein established a Harlem tradition of using some of his illicit earnings to support worthy causes and thus win “goodwill” within the African American community. He donated some of his earnings to humanitarian enterprises. He financed dormitories at Southern black colleges and supplemented the income of a number of Harlem Renaissance artists and supported impoverished Harlem children. His lottery profits also helped establish a Baptist school in Liberia, create a museum in New York and provided hurricane relief for his native homeland, the Virgin Islands. In 1928, Holstein was taken hostage by five white men who demanded a ransom of $50,000. Three days later he was released. After his release he insisted that no ransom was paid. No one was arrested and the incident was never explained. However, rumors abounded Holstein’s abduction was orchestrated by New York mobster Dutch Schultz who eventually took control of Harlem gambling scene. After serving a year in prison for illegal gambling, Holstein “retired” from the numbers racket and spent the remainder of his life supporting various charities. Casper Holstein died in Harlem on April 5, 1944. “Holstein Set Free By Abductors,” The New York Times, September 24, 1928.